Somkiat Chinthammit the CEO of Wealth Management System Limited Company, considered to be the 3rd generation of the group, has shifted from a banker to become an entrepreneur in a software house business. The firm, specializes in finance, was established on Christmas day in 1995 with a logo implying to Water, Sky and Dragon’s flakes. The firm was first established by 13 partners which most of them had worked in CitiBank while some were from the IT field of Shell Thailand. Personally, Somkiat is not an IT but a finance specialist, full of experience from Citibank, a first- class banking institution that has a good operation process. To have the Bonanza software achieved its success is not difficult, for a good program doesn’t mean to have not only correct calculations, but also having good business process itself. Additionally, foreign financial software can not be well implemented to financial institutions in Thailand for the different fixed income and government bond calculation formulas. Somkiat expressed that they have spent 2 years for software development after the decision to launch his software-house business; finally they have got Ayudhya Investment Company Limited (AYS) as their first and valued client from then on. At this time, Wealth Management System Co., Ltd. extends to be 3 business units: Bonanza software, Wealth Consulting Group and E-frontier for trading data via the internet which was newly established. Bonanza Investment, an investment management software application, covers management of securities, fixed incomes investment, and operations of other involved department such as Front Office, Compliance, Back office, and even Risk Management department. The system has up-to-date Financial Model, calculation formulas, and Risk control and management system tailored to match the regulations of the official. The system helps the investors to be disciplined and control investment diversification in each sector. It provides simulation to be used for decision, information, reports, and feeds data in a form of Debit/Credit(accounting form). All of these make an effective operation and data management. Hence, Bonanza’s targets are business organizations, banks, investment& trust companies, fund management companies, assurance companies, life-insurance companies and governmental business units such as Government Pension Fund, Social Security Office. Not only that the company run business in Thailand, but also starting penetrating the foreign markets, for example, Deutsche Bank Group which would like to expand and have the system use in Shanghai and Jakarta, after it was successfully implemented in the Thailand office. Recently, Somkiat accessed to Vietnam in order to fortify his foreign marketing strategy. 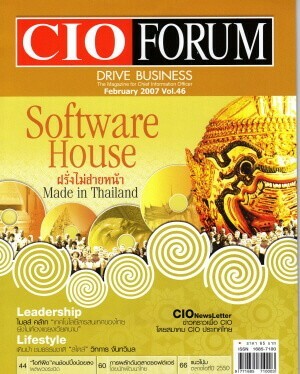 Somkiat has been aware of that software house business from Thailand has a disadvantage for marketing in the foreign market in many cases, unlike Singapore who has established Singapore Infocomm as a federation, settling down in various countries in form of virtual offices to provide all market information to the firm’s subsidiary companies. 2 to 3 months ago, Somkiat and his partners had been the main forces to establish the Association of Thai Software Export Promotion with a purpose to export Thai softwares and its developers or to receive assigned projects from abroad which is a cooperation of 20 dynamic parties in software house business. That means that the Software Market is still attractive and unlimitedly expandable.